Source: Received for an honest review from the publisher. 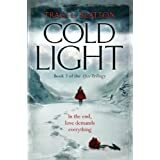 Cold Light picks up over a year after Fallen left off. Emma has made it back to the Safe Zone in Edmonton, Alberta with Haywood and the girls, and quickly brings the reader up to date on how it happened. Even though my heart broke at the end of Fallen when she left Arthur, I understood her reasons. The story begins with Emma facing yet another hardship as her oldest daughter is kidnapped by raiders, and she realizes she must be the one to go after them. The rest of the story follows Emma as she treks across Canada and down into the US following the band of raiders while meeting new friends and being reunited with old ones. Although I didn’t find this second installment quite as engaging as the first one, it is still an excellent story that I wouldn’t hesitate to re-read in the future. New characters are introduced early, and many of them are easy to like and amazingly relatable considering the circumstances of. My favorite early on was Gaff but edged over to Kangee by the end. Emma is still the survivor, Arthur is still the leader, Gaff is the resourceful kid, Kangee is the enigmatic mystery; the rest have their own unique attributes as well. Ms. Slatton did an excellent job creating believable characters and situations based in a hard to imagine post-apocalyptic world. It still impresses me that she can write these characters that despite everything that has happened and continues to happen to destroy the world and humanity as we know it continue to be positive and look for good in the world to help reshape mankind. Yes, there are the cynical characters that are only out for themselves, but she makes it easier to believe that if our world goes to hell in a hand basket one day, all hope may not be lost on humankind.